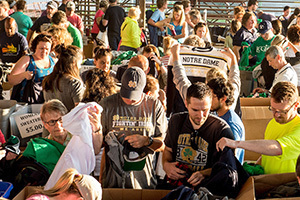 Now in its 13th year, the University of Notre Dame’s Old2Gold sale, a “yard sale” of student donations that supports local charitable organizations, will be held on June 10 (Saturday) at the St. Joseph County 4-H Fairgrounds, 5117 Ironwood Road, South Bend. At the close of the academic year, Notre Dame students donate clothing, bicycles, furniture, refrigerators, storage bins, bedding and more before leaving campus. Volunteers from 29 local nonprofit organizations help to organize and transport the donations to the fairgrounds and take part in managing the sale. Proceeds from Old2Gold are donated to those organizations. More than 1,700 people attended the 2016 sale, which raised $33,489 for the community organizations that operated the event. This year’s event will feature items for sale from the Notre Dame Catalog Store and free parking at the fairgrounds. The parking lot will open at 4 a.m. on the day of the sale. Overnight parking is not available in the fairgrounds parking lots, and attendees are discouraged from parking on nearby streets before the parking lot opens. Also new this year, Notre Dame Human Resources representatives will be onsite to discuss job opportunities within the University’s service outlets and to promote an upcoming job fair. Admission fee to the sale is $5 per person. Children 6 and younger are admitted free. Ticket sales begin at 6 a.m. The sale runs from 7 to 10 a.m., and is a cash-only sale. Old2Gold is one of the University’s most significant sustainability efforts. Each year, thousands of pounds of donations that are sold at the sale avoid being discarded at the landfill. Along with the Old2Gold sale items, the University also makes an impact with other community partners from additional student year-end donations. At the conclusion of the academic year, students donated more than 3,000 pounds of unused nonperishable food items, which were provided to the Food Bank of Northern Indiana. A considerable amount of socks and undergarments were also collected, laundered at Notre Dame’s St. Michael’s Laundry and donated to the Center for the Homeless in South Bend. For more information, visit old2gold.nd.edu or follow @old2gold on Twitter. Originally published by Sue Lister at news.nd.edu on June 05, 2017.